All transactions are safe and secure with a reliable history in online purchasing behind each of our associates. 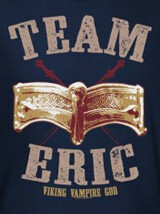 Buy the Eric Northman t-shirt to own True Blood clothing and merchandise. Eric Northman (Alexander Skarsgard) is not a fan of the drink Tru Blood, so he owns and runs the popular vampire bar Fangtasia. Since he believes that "mainsteaming" is not the true way of life for a vampire, Eric often has problems with Bill Compton (Stephen Moyer). He also has issues with Bill's relationship with a mortal. In an effort to get the two on better terms, Sookie works her telepathic magic for Eric and wins his trust. If you don't know what I'm talking about, then grab this True Blood t-shirt and catch up with the True Blood TV show on HBO. In addition to the Eric Northman tee above, browse the True Blood Clothing Gallery for more apparel like men's and women's clothes, kids shirts or hoodies.